I honestly don’t know what to call these. 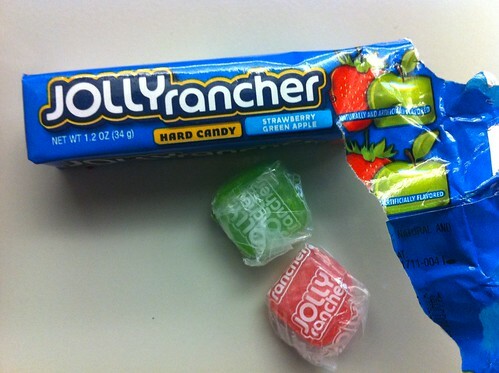 I mean a “Jolly rancher” is typically the individually wrapped tube-shaped hard candy. These are just like that – but are square – more of a classic “mint” type shape. I find these more manageable and they don’t stick to your teeth like the traditional ones do. I also adore the flavor selection here. In a pack of maybe twelve, there is a random split of Green Apple and Strawberry. 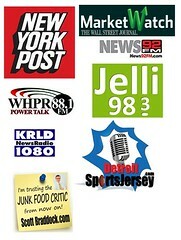 The Green Apple is the classic and often loved flavor we all know – but I had never had a basic “strawberry” JR before. Excellent balance of flavors two if you pop them in together. I suppose the goal here is to try and go after the Lifesavers market? Regardless, these “squares” as I call them are quite good and a welcome addiction. As far as fruit flavored hard candy (which I love!) goes, I’ve never been much of a fan of Jolly Ranchers. Maybe it’s because I almost always give in to that urge to chew hard candies instead of just sucking on them until they’re gone, and Jolly Ranchers are super hard. Or maybe it’s because I find the flavor too tart? I don’t know.